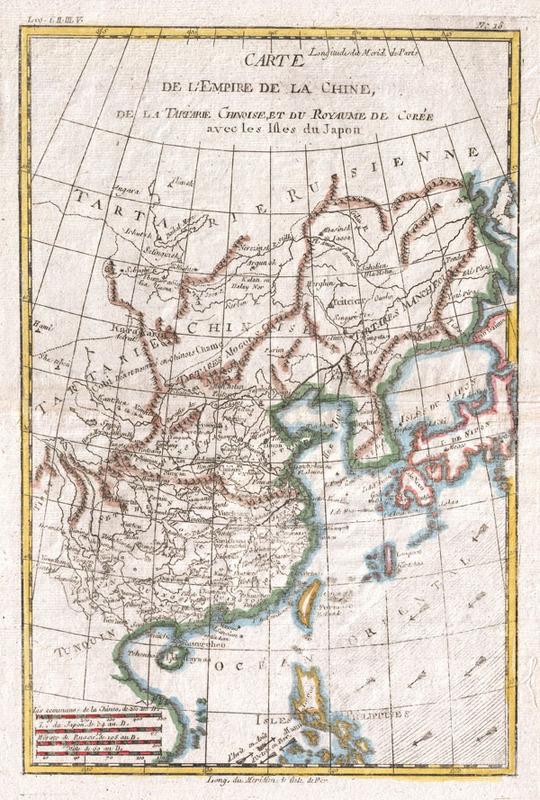 A fine example of Rigobert Bonne and G. Raynal's 1780 map of China, Japan, and Korea. Extends from Tartary (Mongolia) south as far as the Philippines, roughly corresponds to modern day countries Vietnam, North Korea, South Korea, China, Japan and the Philippines. Offers considerable inland detail on the mainland, especially in China and Tartary, however, the interiors of Japan, Taiwan (Formosa) and the Philippines are entirely unknown. Shows some ocean currents and trade winds. Drawn by R. Bonne for G. Raynal's Atlas de Toutes les Parties Connues du Globe Terrestre, Dressé pour l'Histoire Philosophique et Politique des Établissemens et du Commerce des Européens dans les Deux Indes.